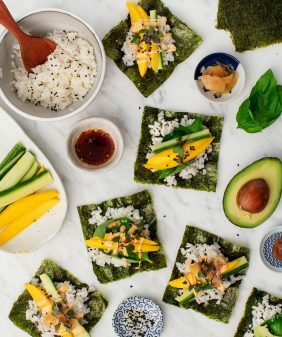 Chard, mango, and jalapeño make sweet & spicy quesadillas for a fun and healthy spring or summer appetizer, lunch, or weeknight dinner. Vegan option. I’ve been living in Austin for nine years now, and I find myself continually surprised and in awe of what grows here. Actually, let me start over…. For the first 5 years, all our food grew from restaurants. The next 3 years, it grew from Whole Foods. Now, (much) of our food grows from Rainlily Farm, Springdale Farm, Boggy Creek Farm, and most recently… wait for it… our front yard. Heat a drizzle of olive oil in a medium skillet over medium heat. Sauté the chard and garlic with pinches of salt & pepper and a few squeezes of lime. Cook for 2-3 minutes, until wilted. Set aside. Toss the mango cubes with a few squeezes of lime and a bit of salt. 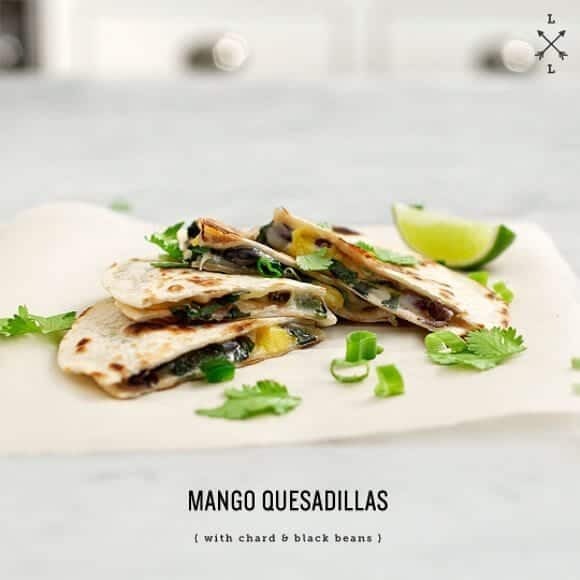 Assemble the quesadillas by layering the cheese, the chard mixture, the mango, black beans, jalapeño, and scallions between two of the tortillas. Grill on both sides until the tortillas are well browned and the cheese is melted. Top with the cilantro, salsa, and avocado, if using, or whatever toppings you like. I love me a good mango and honestly when isn’t a great time for a quesadilla? What a great combination. Isn’t it great to grow your own food, even though here in England I have no chance of growing mangoes or lemons unless I build a green house, but tomatoes and peas make me happy too. This looks awesome! How cool to be able to grow mangos and avocados! It’s my dream world you live in. You can grow mangos and avocados in Austin?! That almost makes me want to live there. The heat, though, oh the heat. Even though I can’t grow mangos, these quesadillas are right up my alley. aaahhh looks so delicious…I love the addition of the lime…a must try in my house!! Gorgeous! I have made quesadillas before using papaya, jalapeno, and brie cheese. But I love the mango/black bean combination and I have some Daiya in the fridge! I, too, am new (er) to gardening, but the bounty we have been getting in the summer is just amazing, and so exciting!! Gorgeous photography! And the mango- a definite for next time. Thanks for the tip. I love mango salsa. 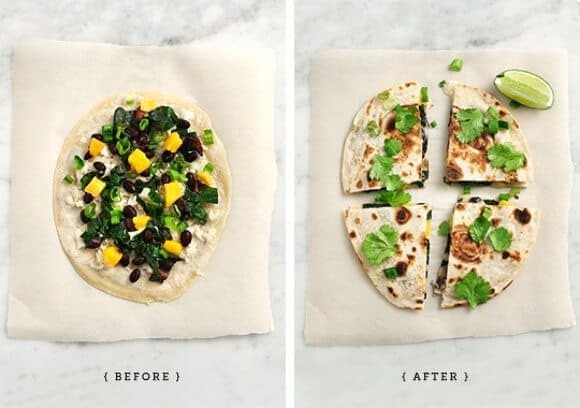 This is such a tasty idea to combine them with black beans in a quesadilla. I’m totally jealous that you can have ANY citrus tree growing much less mangoes! I’d be making fresh mohitos for breakfast. I love quesadilla ! 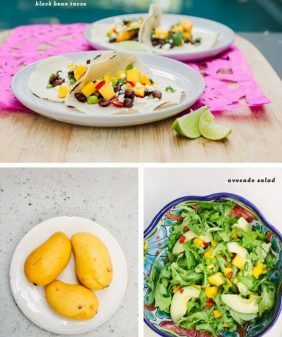 With mango salsa..you just brought them to another level. I love your photos and I am also very jealous of your citrous trees…! Girl, I so get it. I grew up in the Chicago suburbs, too, and I remember (just a few years ago, still living there) looking for something I’d seen on food blogs: a Meyer lemon. Nowhere. And now they’re all over our WF in Nashville. It’s a different world. So impressed and jealous of your home garden and so loving your food perspective. I used to love quesadillas as a kid, but started to find they always seem to have too much cheese. Started to make me feel icky. 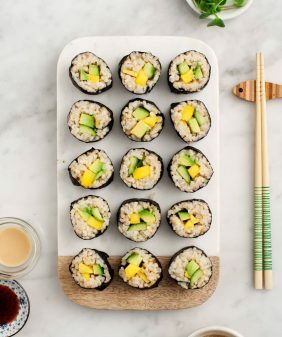 These sound perfect, as there is a nice mix of healthy proteins, fibre and yummy mango with just a bit of cheese. Sounds like my perfect quesadilla. Beautiful photos as always! YUM!! I made this (to the best of my ability) this past weekend! I added some cumin seasoning and a mexi blend cheese for a cinco de mayo treat that my family LOVED. I am also a blogger trying to create and share simple family-friendly recipes that pack a protein punch. 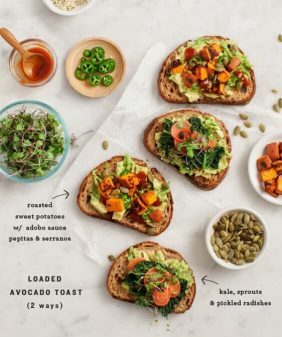 My husband and I are both very active and need to sneak in energy boosters in our meat-free diet. 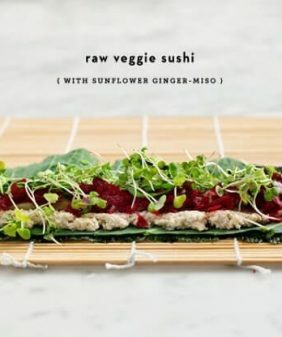 Check it out if you are interested: http://thelivelyvegetarian.blogspot.com/. Thank you for the AWESOME ideas and continued support to the vegetarian community. I wish I lived somewhere where I could garden. I dream of growing kale and chard, cilantro and strawberries. Way to show off your beautiful bounty! 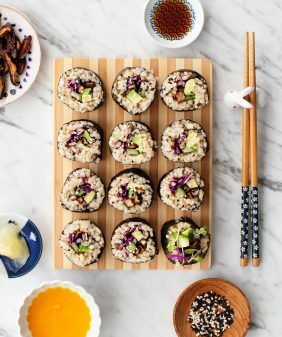 Made these for dinner tonight — fabulous! Thank you!